Foor those who live and work in Washington, DC, the District’s high homelessness rate is a fact of daily life. But the many individuals who post up on street corners or in downtown parks through the night represent just a sliver of the total number of people in the nation’s capital without access to permanent housing. DC’s homelessness rate is more than double the national average, with 124 homeless individuals for every 10,000 residents, according to a January report from the U.S. Conference of Mayors. It’s not just the relative volume that has advocates concerned, but also how quickly that population has grown. From 2009 to 2016, the homelessness rate in the District increased 34.1% — the fourth-biggest jump among cities nationwide. And although the District guarantees homeless families a right to emergency shelter, it continues to struggle to house its homeless population for longer durations. The Washington Post found that the 22% shelter admission rate for families at DC’s main public shelter lagged that of peer cities that also offer the right to shelter — and local officials are pushing for laws that could further restrict admission eligibility requirements. Plans to close the District’s blighted central shelter and replace it with smaller, publicly-run shelters throughout DC have met mixed reactions, in part because of claims that some of the proposed new sites reward donors to the District mayor’s campaign. Meanwhile, public and private groups in DC have long offered smaller-scale emergency and transitional housing catering to the various demographics subsidized housing tends to delineate, including women, families and single men. The latter group makes up 51% of the nation’s total homeless population. (Women account for 17% and families for the remaining 32%.) 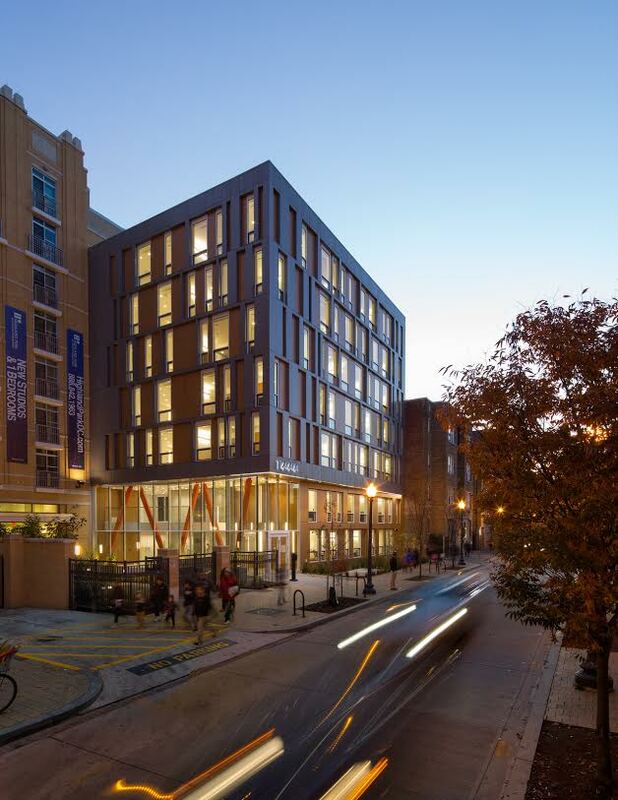 And it was that group that local firm Studio Twenty Seven Architecture was looking to serve with La Casa, the District’s first permanent supportive housing project, run by the DC Department of Human Services. Permanent supportive housing places chronically homeless individuals in long-term housing with support services. In La Casa’s case, that includes casework management, employment assistance and substance abuse counseling for its up to 40 residents. The goal is to get residents on their feet and slowly remove the supports, if at all. La Casa’s design is a driving factor in that mission. 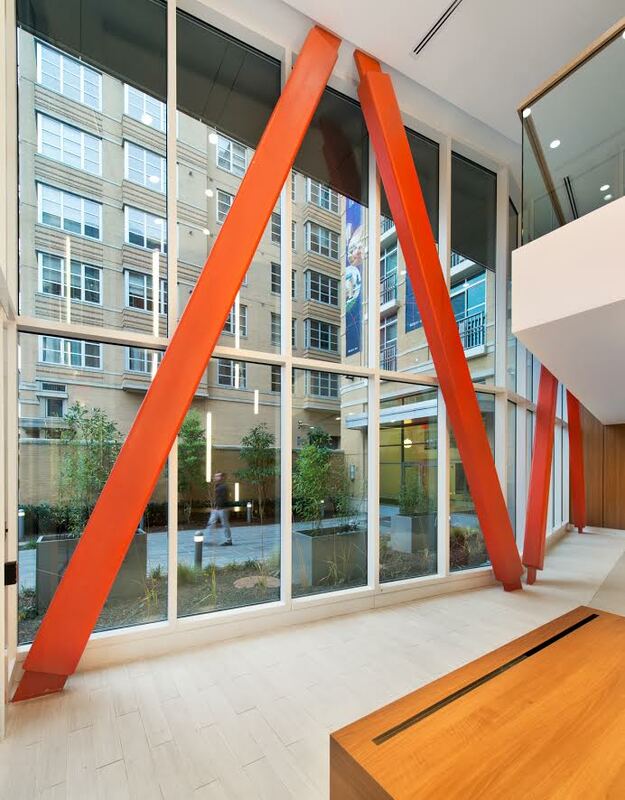 Located in the city’s vibrant Columbia Heights neighborhood, the seven-story, 26,200-square-foot building features 40 private, 300-square-foot studios, each with a bathroom, kitchen, living area and operable floor-to-ceiling windows. The LEED Gold-certified building is clad in neutral-toned concrete board and high-pressure laminate panels to reflect the energy and character of the neighborhood while helping it blend in with other nearby apartment buildings. Construction Dive spoke with Studio Twenty Seven’s Jim Spearman, a project manager and senior designer, and Jake Marzolf, a designer, about the role of permanent supportive housing projects and their work designing La Casa as a joint venture with architecture firm Leo A Daly. How does the building’s design bridge the gap between the surrounding community and this supportive housing space? MARZOLF: The windows speak to that, with them going from floor to ceiling. At the ground level, we really wanted to make the lobby space a beacon for the neighborhood and for that to be present from stepping off the metro to walking along the street’s intersection. At night, you’ll see [the building] really glows from within — it’s meant to be porous and have views to the outside while also giving privacy to the residents. One way of bringing the outside in is through the lobby, which kind of folds in to bring the adjacent garden courtyard space into it and makes the lobby feel larger than it is. SPEARMAN: There’s also a specific relationship between the two-story lobby and the adjacent neighbor, a market-rate apartment building with a private courtyard entry. The boundary between our lobby and that courtyard being this two-story curtain wall, there’s a dramatic sort of synergy between the interior of La Casa and that exterior. MARZOLF: One of the most beautiful things about Columbia Heights is how diverse it is. It’s one of the most diverse neighborhoods you can come through in DC, and this intersection, in particular, is kind of like a miniature Times Square in the sense that there’s constant activity all hours of the day and night. We think having La Casa here is a wonderful addition to the community because it shows you that we don’t have to subdivide different categories of people, we can all co-exist and be effective in doing so. What amenities does La Casa provide and how is it like or unlike other housing developments you’ve encountered? SPEARMAN: Programmatically, in terms of the big-scale things, there are three downstairs offices that provide site-based services for the residents that’s like a concierge of sorts. There’s also a bike room, shared washer and dryer facilities, and an outdoor terrace [on the second floor]. The terrace was conceived as a place both for residents and for the wider community, along with an interior community room that’s able to accommodate all the residents at one time, which was a criterion — for them to be able to all gather in one space at one time. What made the design process behind this project different from other residential projects you’ve designed? SPEARMAN: One of the interesting things about this project is we actually had to do enough research into permanent supportive housing to build up some reasonable level of expertise with the issues around it. The first thing to do was to contextualize permanent supportive housing on the total spectrum of homeless care. Homeless care runs from everything to a night or day shelter to permanent supportive housing. Every individual who is experiencing homelessness is probably at some slightly different place on that spectrum in terms of their needs. There’s a substantial number of people who have been chronically homeless for a very long time. Our research comes from existing [projects] that have just tried giving people a place to live and recorded observations on that. [These projects] are characterizing permanent supportive housing as helping people by giving them a place to live. A lot of these people can keep a job, they can keep a house, they can keep a stable family life — they can do any one of those things, but the problem is that they can’t hold it together. 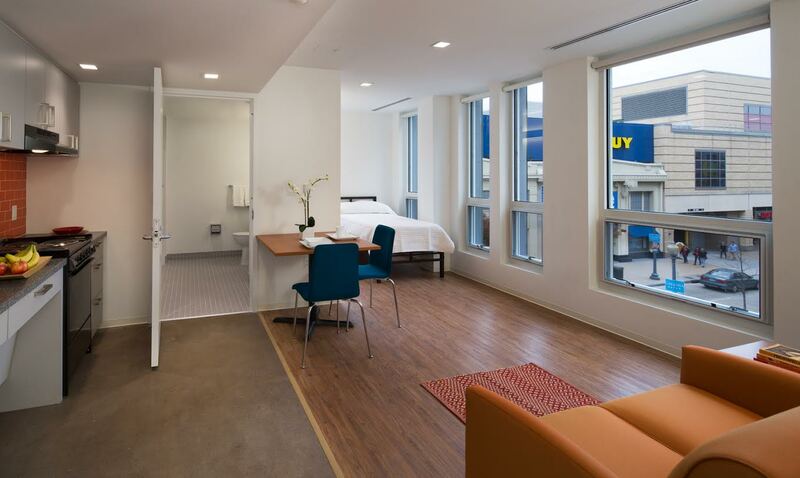 How does the design of this project meet the more specialized needs of someone living in permanent supportive housing versus in a market-rate unit? SPEARMAN: Architecturally, there are a lot of technological things that are specific to permanent supportive housing. There are also programmatic issues related to a sense of belonging and a sense of community. Any time you have a multifamily housing project, you always want to design an entrance that makes someone feel like they have a place to go and a place that’s theirs. But there’s a subtlety to designing physically secure spaces and safe spaces that look really good. The lobby here has a lot of glass, a view of the courtyard and feels very open, but what you don’t see is that the place is on total lockdown. One of the challenges with permanent supportive housing is providing the level of physical security that’s required — not that it’s extreme — for people’s safety, while at the same time providing the experience of transparency that is important from a design point of view. When you get down to it, you find that the interior environmental needs [here] are exactly like the interior environmental needs that any human being would need — daylight, oxygen, a place to use the bathroom. You may not need a lot of space, but if you have those things, and a little space, you’d be surprised at how effective that is. From a design perspective, the basic human habitation is absolutely no different from any other housing project — in some ways, it’s more critical in this context. How do the units within La Casa and the overall building compare to other similar residential projects? MARZOLF: It really comes down to the unit type — these are basically studios. There’s a bathroom, but no other walls outside of that. Each unit has its own kitchen and appliances, so residents have the ability to cook for themselves in their own space. SPEARMAN: The interesting part about this development is that you could easily sell this as a market-rate apartment building. There’s really not a difference between these units and other local market-rate housing units, other than the people. The floor area per unit is the lowest it can be and still be compliant with the building code and provide that basic living function. But if you go to the market-rate housing next door, you’ll find apartments for rent that are very similarly sized. Are you working on any similar affordable or permanent supportive housing developments in and around DC? MARZOLF: We’re currently working on Ward 6: Short-Term Family Housing, a short-term family housing facility that will house 50 families in Southwest DC. It’s part of [Mayor Muriel Bowser’s] initiative to close D.C. General [the District’s central homeless shelter]. We just finished the design on that, and we hope to start construction by November 2017. SPEARMAN: We’re interested in continuing to work on these kinds of developments because, at this point, we have both the design experience and the program experience to help other folks in the region who are interested in developing similar projects.